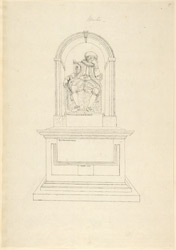 An outline drawing of the monument of Francis Bacon, Lord Verulam, in St Michael's church, near St Alban's in Hertfordshire. Bacon's family came into possession St Alban's abbey and the surrounding lands after Henry VIII's dissolution of monastic houses. Francis Bacon became Viscount St Alban's during the reign of Elizabeth I.